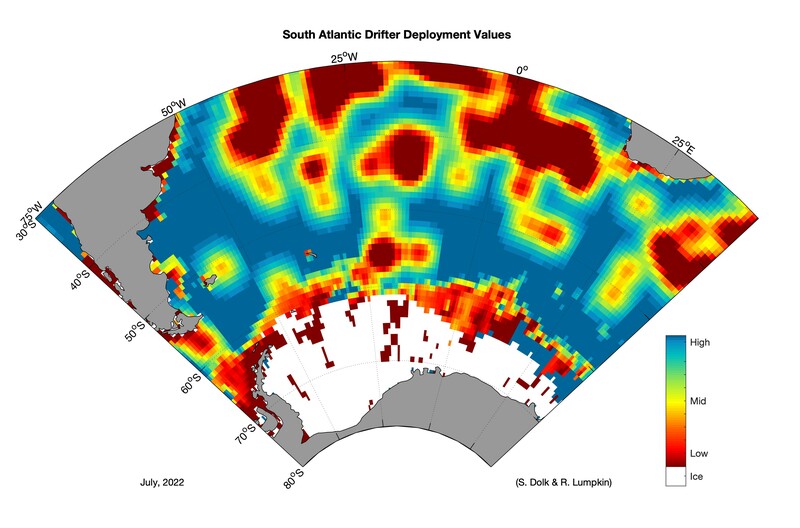 This page contains instructions to download global hourly location and velocities from GDP surface drifters tracked by Argos or GPS, as described in Elipot et al. 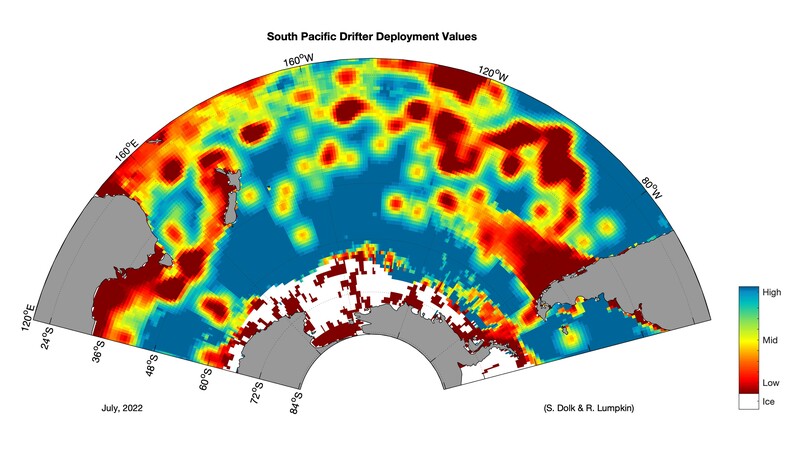 (2016), "A global surface drifter dataset at hourly resolution", J. Geophys. Res. 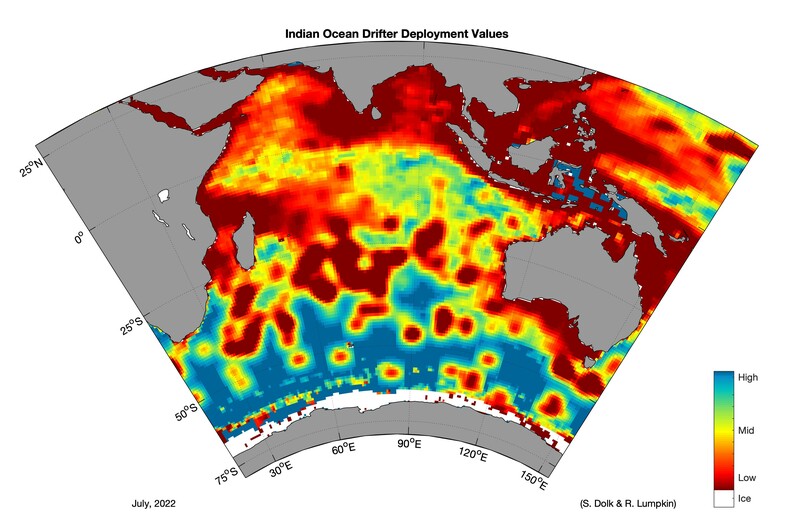 Oceans,121 doi:10.1002/2016JC011716. 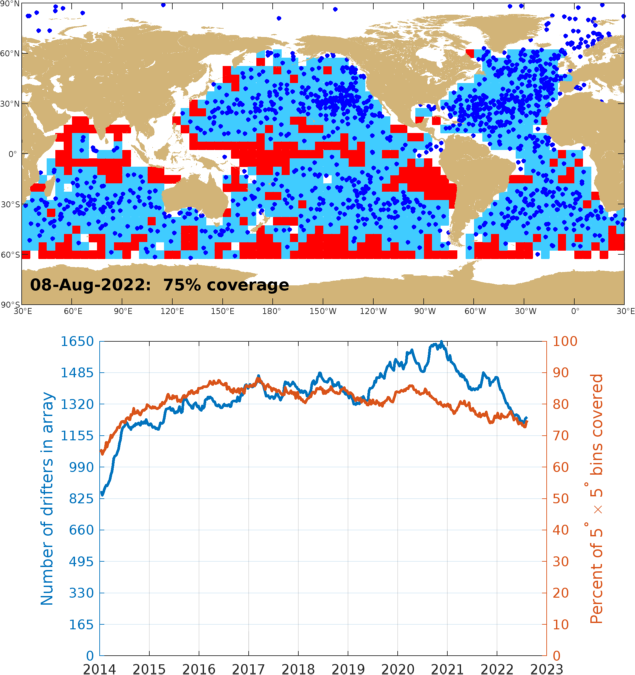 These data are a subset of the historical 6h data when hourly resolution became possible. 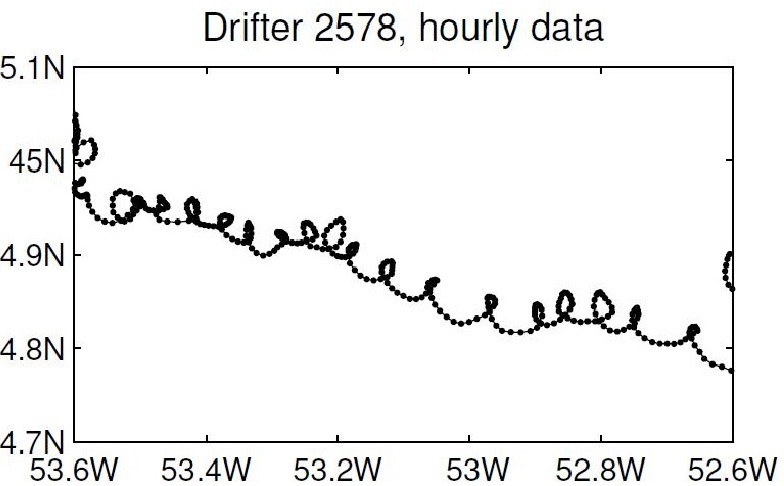 The interpolation methods for drifter trajectories tracked by the Argos system and by the Global Positioning Sytem are the same as for version 1.00, described in Elipot et al. (2016). This 1.02 update adds an additional 3 years and 4 months of quality-controlled data to v1.00, up to 1 November 2018. In addition, we have added data before 1 September 2005 (the start date of v1.00) by considering all GPS-tracked drifters since the beginning of the GDP, and all Argos-tracked drifter data since the beginning of the GDP, when the average of the uneven sampling intervals per trajectory is less than or equal to 3 hours. As a consequence, the hourly dataset is a subset of the 6h dataset, which goes back to 1979. 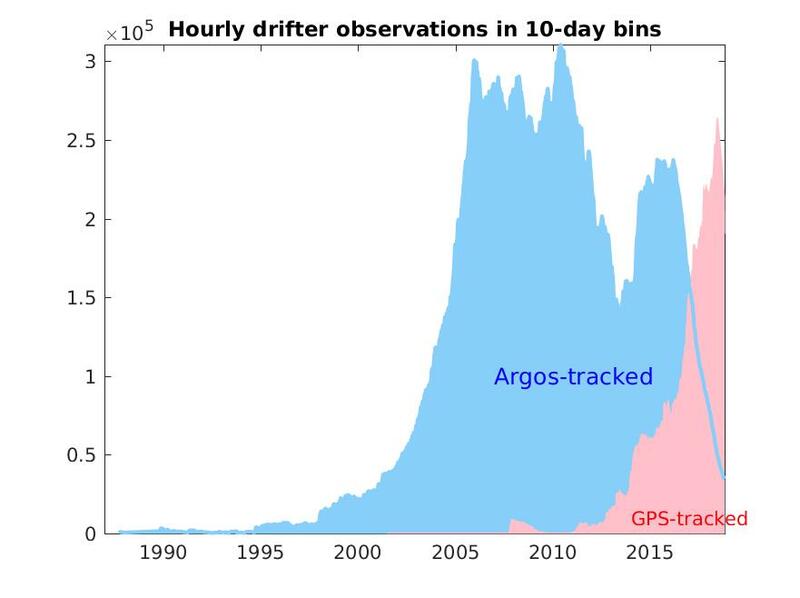 In v1.00, some drifters were erroneously categorized as being either Argos-tracked or GPS-tracked. This was corrected in v1.01. 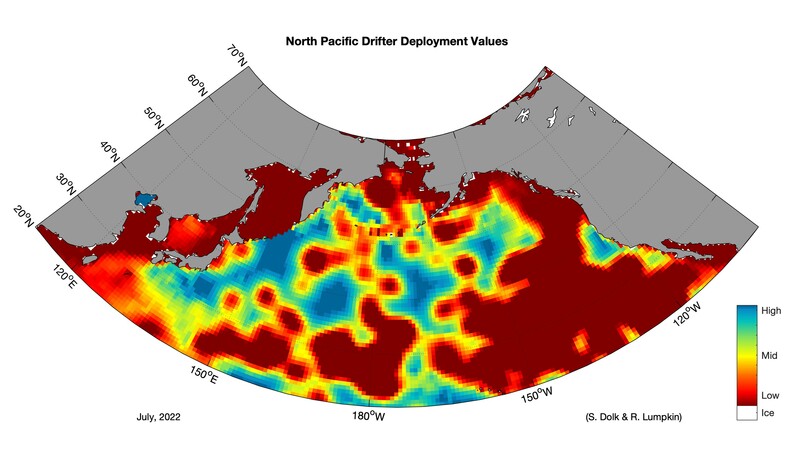 In addition, when drifters were tracked by both systems, only the GPS trajectory is contained in the dataset (starting v1.01). In v1.00, there were repeats when merging the Argos and GPS files. In verions 1.00 and 1.01, the WMLE (Argos) data were contained in a single, very large file. They have now been broken into seven smaller non-overlapping files, with file extensions "_blockN". Each file contains a unique set of drifters (no drifter is in multiple files). The only updated data is in block 7; blocks 1-6 contains drifters no longer alive as of v1.02, and will not be updated after v1.02. The position and velocity estimates from GPS-tracked data are now provided (since v1.01) with formal 95% confidence intervals from the weighted least squares solutions of the estimation, assuming an observational error of 22 m for GPS positions. We diagnosed this observational error from the overall distribution of the GPS data received at the Data Assembly Center of the GDP. In order to obtain acceptable confidence intervals, the LOWESS processing of the GPS positions has been implemented to make sure that at least 3 data points are used for each estimation. This differs from v1.00 of the dataset for which only 2 data points were sometimes used. The data are provided via anonymous ftp as ASCII files (compiled in a compressed tar file) and as NetCDF files. 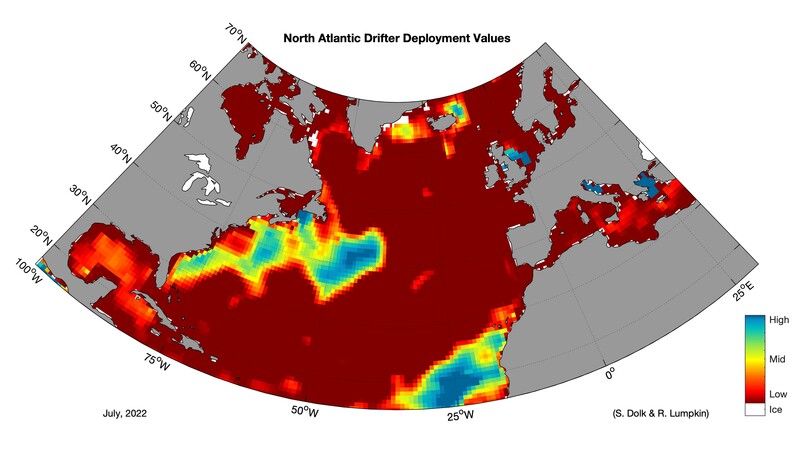 The data from Argos-tracked drifters are in the files containing the acronym WMLE (Weighted Maximum Likelihood Estimation), referring to the interpolation method used for Argos fixes. For ASCII files, please refer to the accompanying README file. The data from GPS-tracked drifters are in the files containing the acronym GPS. For ASCII files, please refer to the accompanying README file. For the NetCDF files please refer to the metadata within these files. ftp://ftp.aoml.noaa.gov/pub/phod/buoydata/hourly_product and download the files you need. Queries, questions, comments, and the reporting of issues with these products should be directed to Drs. Rick Lumpkin or Shane Elipot. If you would like to receive notifications of updates to the hourly data set, email your request to Rick Lumpkin. Elipot, S., R. Lumpkin, R. C. Perez, J. M. Lilly, J. J. 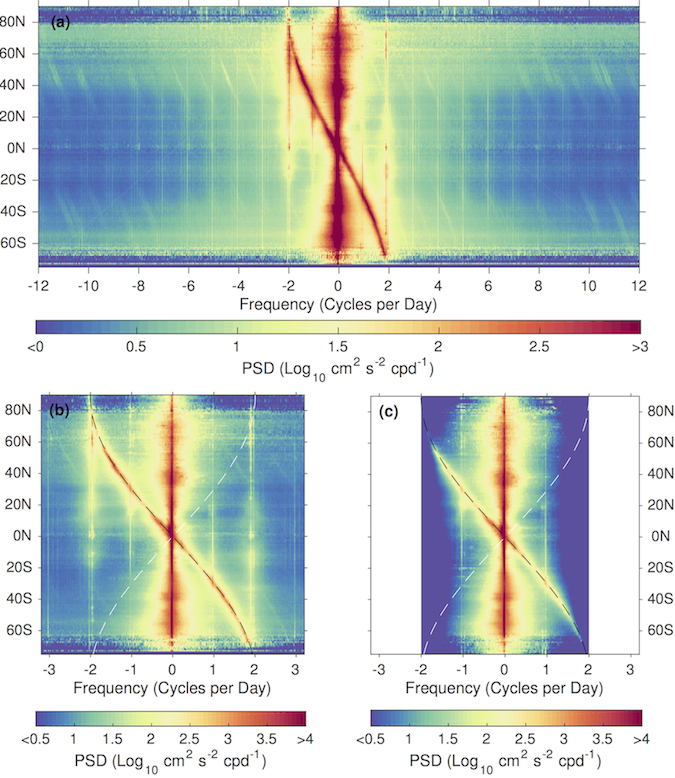 Early, and A. M. Sykulski (2016), "A global surface drifter dataset at hourly resolution", J. Geophys. Res. 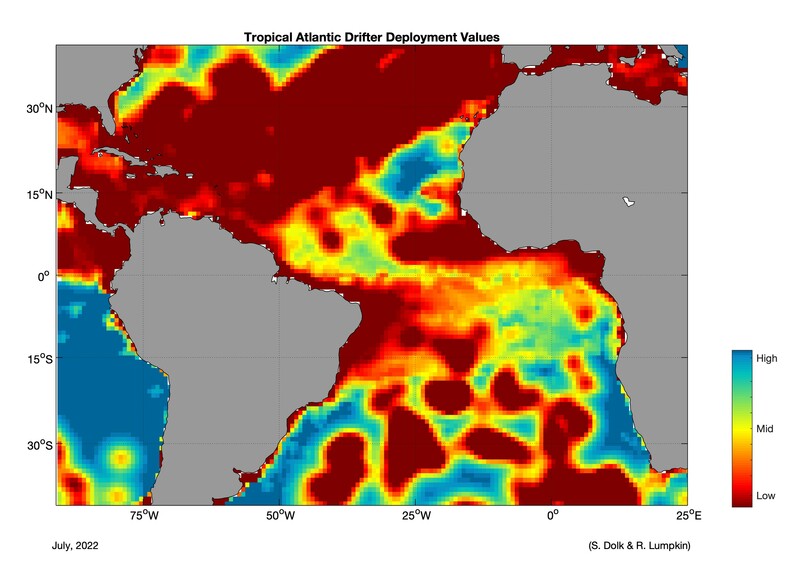 Oceans, 121, doi:10.1002/2016JC011716. 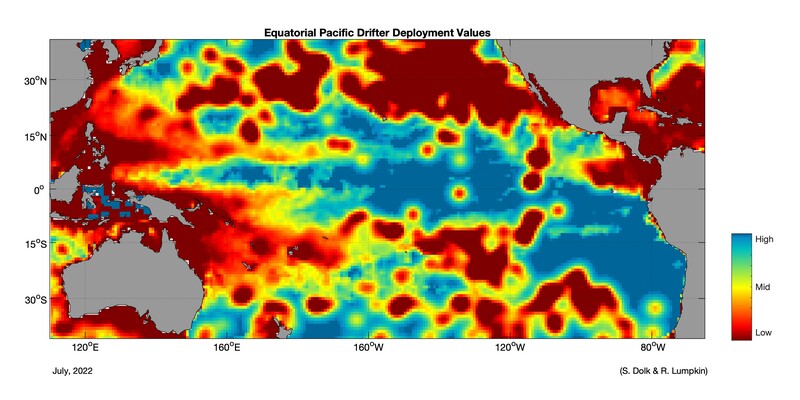 Preliminary analyses of the drifter velocity variance showed that this dataset is a valuable new tool for the study of relatively small-scale and high-frequency, oceanic processes. In particular, velocity rotary spectra suggest that high frequency tidal and internal wave motions are detectable globally. Below is a figure adapted from Elipot et al. (2016) which illustrate that the new dataset exhibits more velocity variance compared to the 6-hourly velocity product. 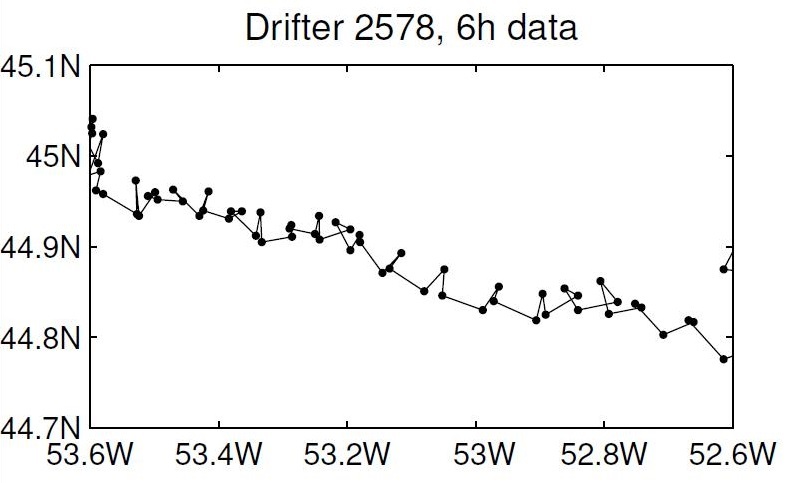 Figure caption: (a) zonally averaged drifter rotary velocity spectra in 1 degree latitude bins from 2048-hour (~85 days) trajectory segments at 1-hour resolution, overlapping by 50 percent, from the new global hourly product. (b) same as in (a) but zoomed in for frequencies in the range +/- 3.2 cpd. The black dashed curve indicates the inertial frequency (-f/(2*pi) cpd) and the white dashed curve the Coriolis frequency (f/(2*pi) cpd). Note that the color scales indicate different ranges of values and are both saturated. (c) same as in (b) but calculated from the post-2005 6-hourly Kriged global product for the same trajectories.